Chicago Public Schools sold the Overton Elementary School building on Wednesday to a developer planning live-work apartments in the former school. HYDE PARK — Overton Elementary School is being reimagined as a live-work complex for accountants, chefs and others who want to work at home. 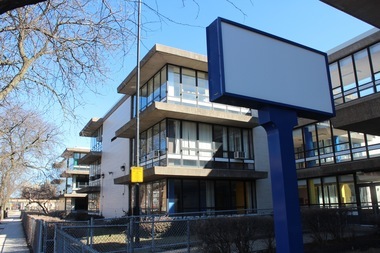 On Wednesday, the Chicago Board of Education signed off on selling the shuttered school at 221 E. 49th St. for $325,000 to the Washington Park Development group, which is planning to convert the building to live-work apartments. “The school has been a resource in the community for a long time, so I want to keep it as a resource in the community,” said Ghian Foreman, head of the development group based in Washington Park. The special zoning allows people to run a business out of their home, a feature that, for many licensed businesses, is typically limited to commercial properties. Since introduced in 2012, live-work buildings in Chicago are most often marketed to artists who want to keep a studio or gallery space in their home. “I’m thinking broader than that,” Foreman said. He said he wants the building, which will take a year to renovate after all city approvals are in place, to be full of chefs, accountants and others who want a small office or commercial kitchen space in their home, but otherwise couldn’t because of limits on their licenses. Foreman offered himself as an example. He said he doesn’t need a lot of office space to do his work as a developer, but is limited to working from commercial spaces by his commercial developer license. He said he is planning a café for the first floor and is still working on ideas for the building's gym. He’s hoping to get some ideas during the lengthy community process Ald. Pat Dowell (3rd) has required of any developer taking over the school. Neighborhood groups passed on bidding for the property because of angry neighbors and the stigma attached to the building from its closing and moving the students to Mollison Elementary School in 2013. Foreman said his aunt was a teacher at Overton and he understands what it meant to the community when the school closed. “I want the community to trust me and be a part of the development,” Foreman said. Overton was one of three schools sold by CPS on Wednesday for $8.5 million. Also sold were Near North Elementary, 739 N. Ada St., and Von Humboldt Elementary, 2606 W. Hirsch St.
CPS also announced Wednesday it would sell Trumbull Elementary School at 5200 N. Ashland Ave.